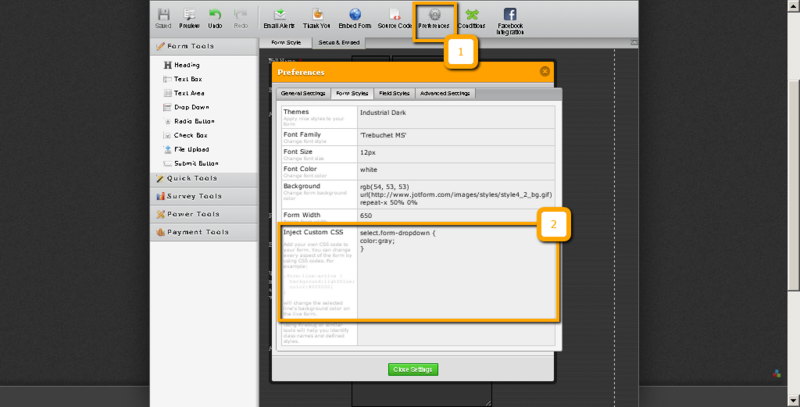 In creating the form, I selected a specific background but two of the items show as a white background and stand out whereas they should all be the same. Please advise how I can correct this before I try to embed on my website. Awaiting your response so that we can further assist you. I have not yet embedded the form. When I open it as a stand-alone the problem is apparent (on my end). I just tried again (my forms, preview, etc.) and it’s still like that. I am still working on the website which is not yet “live” so have not embedded the form yet. Thank you for any further info you can provide…..I suppose it could be something in my computer system?? Thanks for clarifying Hal. It would have been helpful in our investigation if the page is live but no worries if it is not yet up. Perhaps a screenshot of the problem would suffice for now. Also, I tried accessing the only form under your account but did not find any issues with it. Can you please try to access it once again? If the issue persists, please send a screenshot as stated above. We appreciate your patience on this matter. Thank you for using JotForm! Very strange indeed. I just pulled it up on another computer and same problem. The "country" and all of the "birth date" blanks are white. I can't seem to get a screen shot to "take" or paste into this box. I guess I'll just wait and see what happens once I get the site up and running. P.S. Your screen shot looks fine so hopefully that is what I'll end up with. 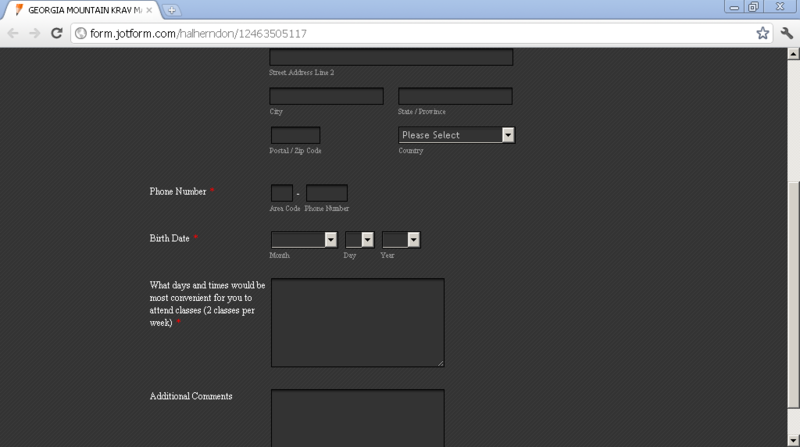 Apparently, your problem concerns an issue with drop down fields not displaying background properties in Google Chrome. This has become a bane for web developers because no amount of css injection can change the drop down field's background. There is a way to change the background property of individual drop down option, but the actual field will still remain as is. Note that I am still working on the site and it is not "live" at the moment. 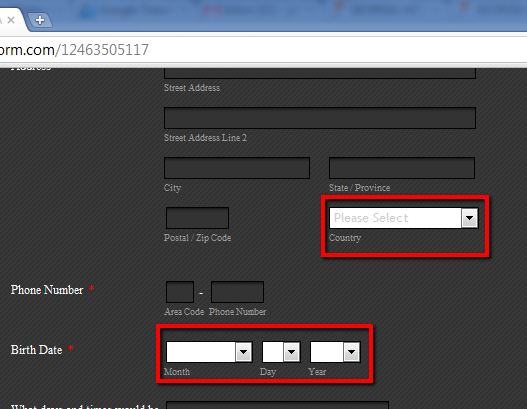 However the form does not come up correctly. It also looked the same on IE and Firefox (which I believe don't exhibit this problem you reported). Could it be possible for you to try opening the form using another computer and let us know how it looks like from there? I remain completely baffled. I have checked that web page on two different computers and both come up the exact same way. Somehow your screenshot comes out exactly as it should while mine does not. I do not at all understand the process in your previous response about injecting the CSS thing so I was not able to try that. I may have to find another form source before this is all over, as I cannot afford for the on screen image to appear shoddy. Another thing that might help is to change the form's URL from http://form.jotform.com/halherndon/12463505117 to http://www.jotform.com/halherndon/12463505117. Not really sure it will solve problems like your but it's worth a shot also. Thanks for your patience on this matter and let us know how it goes for you. I just looked at the link for your CSS thing and it's the same as I received previously. I still have absolutely no clue what to do once I open the link. This is all very new to me. I thought the process was supposed to be easy. Note that the css code I provided will only change the color of the font in the drop down to make it appear more visible against a white background (in Google Chrome). It will not and cannot change the actual background property of the drop down field. I took the intiative and did it for you. 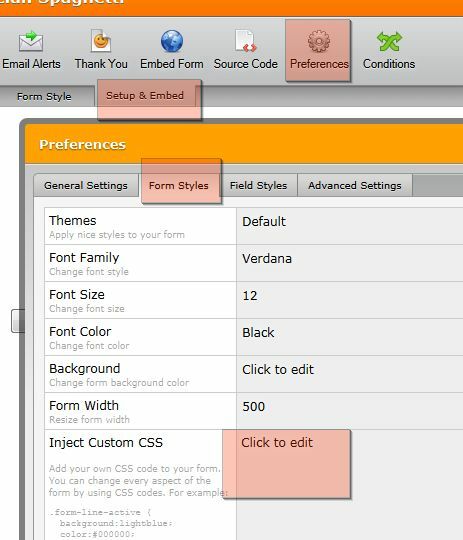 In case you want to doit in the future, just (1) click Preferences in the toolbar and (2) go to the Form Styles tab of the Preferences Wizard and enter the custom CSS code you want to inject in the Inject Custom CSS field as shown above. Please refresh your form and access it again using the web browser concerned. Let us know how it looks like by then. Thank you for the help. Here is what is happening currently: When I open the form in google chrome, either through your site or my website I still get the white blanks in the same place. HOWEVER, when I open the website page and link in Explorer it is fine. Apparently there is something maybe lingering in google chrome that needs to be worked out. In any case I suspect I can use it now unless I get some complaints once it's all 'live'. Thanks again. YOu have been extremely helpful. Glad we were able to help you in this case. To be honest, there are a lot of compatibility issues when it comes to the way browsers render a certain webpage element. The best thing we can do is adapt, until the people who created this browser (Google) does something to fix it. If you have other issues that need to be addressed, please don't hesitate to let us know by opening a new thread. Thank you for choosing JotForm as your form builder!